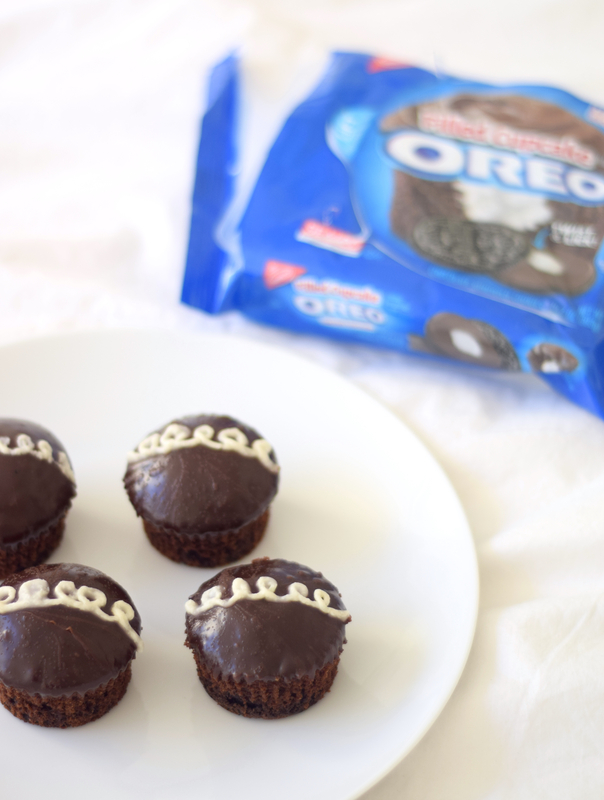 OREO is constantly unveiling new flavors & their latest one had us very curious: Filled Cupcake OREO. Naturally, it only made sense to eat the Filled Cupcake OREO inside well, a filled cupcake, of course! So we did just that: chocolate cupcakes filled with frosting, topped with chocolate ganache, swirled with more frosting, all while sitting on a Filled Cupcake OREO. It’s the ultimate filled cupcake recipe that’s surprisingly super easy to create. Although you do have to wait a few minutes to let the cupcakes cool before dipping them in chocolate ganache & icing them, we do recommend serving these bad boys warm. Pop ’em in the microwave for 15-20 seconds, just until the ganache starts to get super shiny & it will be perfect. 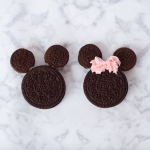 The flavors of our cupcake recipe mixed with the OREO is indescribable. Possibly, what we think, one of the best OREO flavors to date. 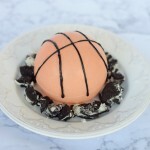 Check out more of our favorite OREO recipes: here. In large mixing bowl, combine all cupcake ingredients sans OREO's. Stir to combine. Line cupcake tray with liners. 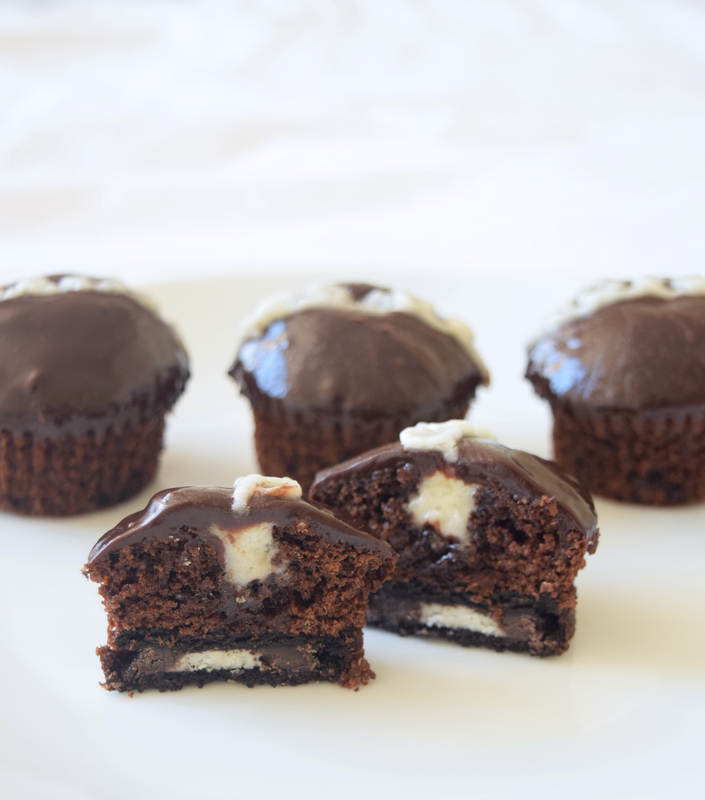 Place one OREO in each cupcake liner. 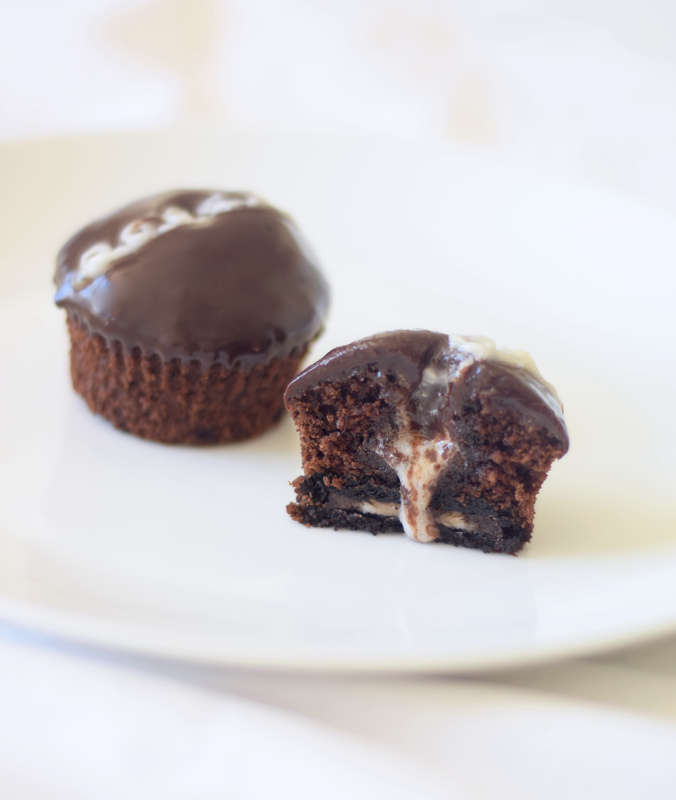 Pour batter over OREO until cupcake liner is ¾ full. Bake roughly 20 minutes or until toothpick is inserted & comes out clean. Let cool completely & then remove from liners. In small mixing bowl, combine all frosting ingredients with electric mixer. Place frosting in frosting back with wide, round tip. 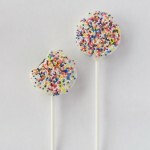 Gently stick the tip of the frosting bag into the center of each cupcake & squeeze until first sight of frosting appears. Immediately remove & repeat until all cupcakes are filled. In small bowl microwave the heavy whipping cream until it begins to bubble, roughly 1 minute. Stir in the chocolate chips immediately until the ganache forms. 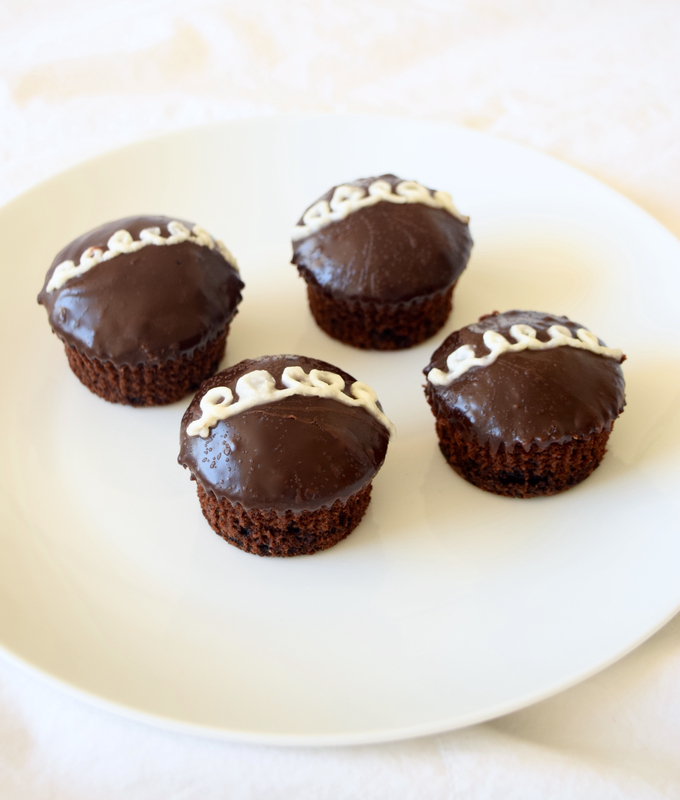 Dip the top of each cupcake into ganache & set aside. Place small, round tip onto frosting bag & create a repeated loop line from one end of the cupcake to the other. Serve warm & enjoy! 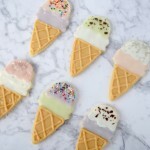 Yum these look so good! 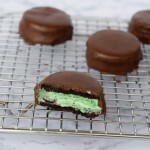 I love Hostess cupcakes and these look identical! Major yum! These look amazing. ah these are so cute! and they look oh so tasty!